1. 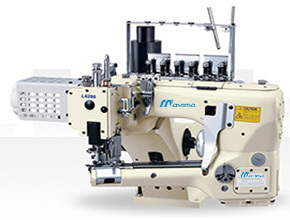 This system ensures smooth feeding of various fabric: from single jersey to fleece, stretchable and uneven thickness portion. Besides, overlapping amount of upper/lower fabric is easily adjustable. 2. Small Cylinder-bed circumference at the needle dropping point is 148mm. The small cylinder-bed enables small tubular operations. 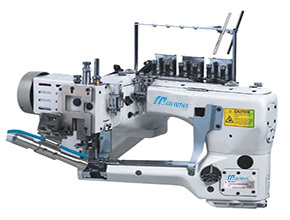 Also, long cylinder of 200mm before needle dropping point provides a wide operation space. 3. Unique design for tangle free and smooth supply of threads. 4. Easily adjustable for differential ratio by outer lever. 5. Thread tension can be adjusted individually for neat stitch formation. 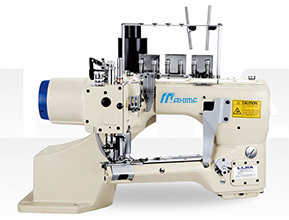 Máquina de costura plana Flatseamer 4 agujas, 6 hilos con motor bajo consumo. Con alza prénsatelas y absorbe residuos. Estas máquinas cosen fácilmente diferencias de sectores de costura transversales. Sectores como los refuerzos en ropa interior masculina y femenina quedan con una terminación sin molestar la piel.